Last week, Israeli Prime Minister Netanyahu celebrated the festival of Tu B’shevat (“The New Year of the Trees”) by leaving a meeting with American peace envoy George Mitchell and promptly embarking upon a tree-planting tour at Jewish settlements in the West Bank. The message is clear – we are here and will remain here. We are planting and building; this is an inseparable part of the State of Israel. The olive branch, what is the reason for this? 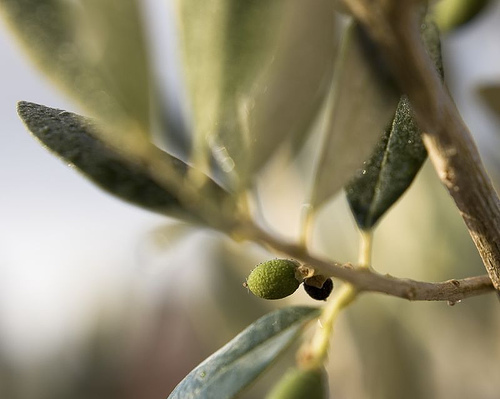 We raise the olive branch as a symbol of responsibility, identification and hope. We raise this branch in sorrow because each and every year, olive trees, the source of livelihood for Palestinian families, are intentionally chopped down, burned and uprooted. In attempting to exercise their right to work their lands, farmers repeatedly put themselves in danger. Both the human being and the trees of the field are desecrated, and there is no earthly law or judge (ein din v’ein dayan). Only a few are guilty, but all are responsible (Rabbi Abraham Joshua Heschel). On Tu B’shevat, we are taught that the trees cease to drink from the rains of the past year and begin to be nourished from the rains of the current year (Jerusalem Talmud, Rosh Hashanah 56a). However, into the old and the new waters have fallen the tears of the dove of peace whose feet cannot find a resting place (Genesis 8:9) because the earth has become filled with violence (Genesis 6:11). The olive branch has become bitter in her mouth – a symbol of strife. We raise this branch as a symbol of identification with those Israelis and Palestinians who are doing everything in their power to change this reality and make enemies into friends (Pirke Avot De’Rabbi Natan) by planting, pruning, plowing and harvesting together, despite the voices of hate and incitement from both sides. May it be Your will that the fruit of the olive, symbol of the World of Yetzirah/Creativity (Pri Eytz Hadar) inspire us to create justice and peace out of the basic materials of the soil, the fruit of the soil, and the human spirit (adamah, pri adamah, ve’ruakh ha’adam) so that by the time evening falls (Genesis 8:11) we will reconnect the olive branch to the root of the soul (Shoresh Nishmato). May we thus beat our swords into plowshares and our spears into pruning hooks…so that every person may sit under their vine or fig tree and none shall make them afraid (Micah 4:3-4) and the land shall know tranquility (Judges 3:11, etc.) and all of its inhabitants will rejoice. This entry was posted in Israel, Judaism, Palestine, Peace, Politics, Prayer, Religion on January 29, 2010 by Rabbi Brant Rosen. This is one of those lovely reminders that we can use our history, traditions and scripture to move us toward peace and justice … or we will use them to continue the division and hatred for which we are all responsible. It is really up to us. Comments such as those by Netanyahu are made only when they are no longer an assumption. Were it really true, it would not seem to need such assertion.